Harvard Law School professor Larry Lessig is an unlikely presidential contender. But his sudden leap into the 2016 race means that he’s serious about it. Long ago, Larry Lessig relished the private world of an academic. That was another life, though, before a cartoon version of his face—grey hair, tiny round glasses—cropped up all over the internet, before he discussed his books and joked around on TV shows like "The Daily Show with Jon Stewart." That was before he decided to run for President of the United States. When I meet with Lessig at a restaurant in Harvard Square, it’s a gloomy September afternoon, the day after he’s officially announced his bid for the presidency in the small mill town of Claremont, N.H. The interview was difficult to schedule. Lessig’s been traveling a lot recently and only has 30 minutes to spare. Leaning over the table on one elbow, he seems tired and stressed. He got back to Boston late the night before after meeting with campaign organizers and missed dinner with his family. Right now, he’s anxious about a last-minute flight to Washington, D.C., which will leave in a few hours. After this interview, he says, he’ll be rushing off to another. “I need some coffee,” Lessig says wearily, reaching under his thin-framed glasses to rub his deep-set eyes. The day before, on Sept. 9, Lessig stood under a sweltering sun about 115 miles northwest of Boston, speaking to the few dozen supporters who had somehow found their way there at noon on a Wednesday. They were all gathered in the grassy backyard of a senior center, partly hemmed in by a few gnarled apple trees, fanning themselves with Lessig 2016 posters. To an outsider, the event probably looked less like a presidential launch than a peaceful outdoor sermon. And Lessig was the preacher. He had just raised $1 million in crowdfunded donations—the amount he had set to kickstart his presidential campaign—in less than a month. His speech was exacting, crisp, well-performed; it bore the cadence of practiced rehearsal. America’s democracy had been bought, Lessig charged. He was going to pour every ounce of his energy into taking it off the market. The plan, which he elaborated that day, is simple, if unconventional. Lessig is campaigning to pass a package of reforms aimed at changing the way American elections are conducted and financed. If he wins, and is able to pass those reforms, he will immediately step down and let his vice president assume power. But Larry Lessig wouldn’t call himself a politician. No one else will call him a politician. Many of his own friends don’t think he seriously wants to become president. To most, he’s a law professor at Harvard who’s become somewhat of a celebrity in the past two decades. That part makes sense—he practically invented the field of cyberlaw, colleagues say, later turning his attention to the study of institutional corruption, a decision that placed him on the national stage as an outspoken critic of the influence of money in politics. But President of the United States? A quiet man in private—at times, even awkward—Lessig hardly seems the man for the job. His campaign, too, is strange and sudden. It’s so sudden that critics charge he’s only running to bring attention to a cause. But these critics don’t take into account that the entirety of Lessig’s career—academic and otherwise—has evolved from a domineering interest in the structures of power that abound under a democratic system of government. And perhaps more importantly, for Lessig, a sudden leap into a project is the surest sign that he’s serious. Like many dramas, Lessig’s academic career has three major acts. The first largely took place at Yale Law School and the University of Chicago, where he studied constitutionalism in Eastern Europe. The second, at Harvard and Stanford, where he studied the internet and copyright law. Lessig is currently immersed in his third act, as an activist and scholar probing at institutional corruption, and, more recently, campaign finance. Kathleen M. Sullivan, who worked with Lessig when she was dean of Stanford Law School, says it’s “highly unusual” for a scholar to work in so many diverse fields, even under the broad umbrella of legal studies. But Lessig is quick to point out that he sees a common thread in his work: the study of institutions and their power. To understand that link, Lessig says, he’s had to reach back into his past, to a time he’d rather not think about. He was 14 or so, attending the all-boys American Boychoir School in Princeton, N.J., where he boarded. There, Lessig was head boy—a prestigious position—and a successful student. It was only 10 years ago, in a piece written for New York Magazine, that Lessig publicly revealed he had been sexually abused by his choir teacher while in school. Reflecting on his time at boarding school, Lessig says others were certainly aware of what was happening to him and other boys. But no one did anything. Though Lessig wouldn’t publicly discuss this experience for many years, his concern with power structures began to dominate his thinking when he went to law school. At Yale—where he transferred after a short stint at the University of Chicago—Lessig was reserved and private. Even today, as colleagues attest, he’s not one to make small talk, preferring to say nothing rather than fumble about on boring subjects. But inside the classroom, friends remember, Lessig was forceful and intense, scrutinizing professors’ claims and challenging them frequently. In a class on constitutional law, Lessig made a habit of sitting in the back of the classroom, a space usually reserved for students attempting to avoid participation. But for Lessig, the back of the classroom was something different. 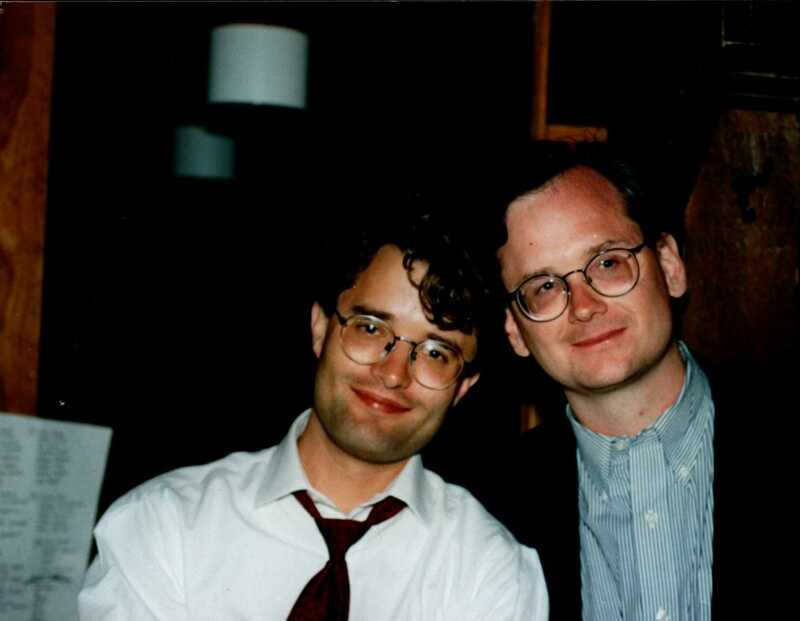 Larry Lessig and Alex Whiting (left), a professor of the practice at the Law School, pose for a photo at Whiting's wedding in 1993, where Lessig was a best man. The two attended law school at Yale together. During law school, Lessig lived in “the world of ideas,” says Andrew Koppelman, a law professor at Northwestern and a classmate of Lessig’s at Yale. Lessig was always focused on the big picture; he thought endlessly about constitutions and the future of global politics. He would live in that world long after graduating in 1989, the year the Berlin Wall fell, and after he began studying Eastern European constitutionalism full time as a professor at the University of Chicago. That became Lessig’s area of expertise: trying to figure out how governments in a splintered region could regroup and restructure their constitutions. 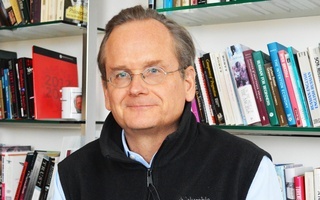 Lessig became such a known expert in the field that “The West Wing,” a political drama television series, featured him in one episode as a scholar who helped craft Belarus’s new constitution. He also befriended his future wife, Bettina Neuefeind, through this work at the University of Chicago. But, in what would become a pattern in Lessig’s academic life, those studies eventually ran their course. In the early 2000’s, Lessig and his wife moved out west to San Francisco, a far cry from Chicago or New England. It was in the heart of the Silicon Valley that Lessig reinvented himself, taking on a different academic identity well suited to his new home. Lessig and others say he rose to public prominence during this period with his work on cyberlaw and copyright law. It’s also when he first began to consider himself an activist, someone who pushed back against stringent copyright laws and restrictive corporations. In 2001, while at Stanford, he co-founded the nonprofit Creative Commons, which provided people more customizable copyrights licenses. He created the seamless style of presentation for which he is now famous, flashing words across a screen synchronized with his own speech. He began appearing on talk shows, writing books, penning op-eds about free speech, privacy, and the internet. But by publicly championing freer use of the internet, Lessig began losing some of the privacy he so loved. Before, Lessig could close his office door when needed and bury himself in writing and preparing for classes. But those days were gone. Now, Lessig needed to respond to public demand for information, something that has only ever increased since he began studying politics. 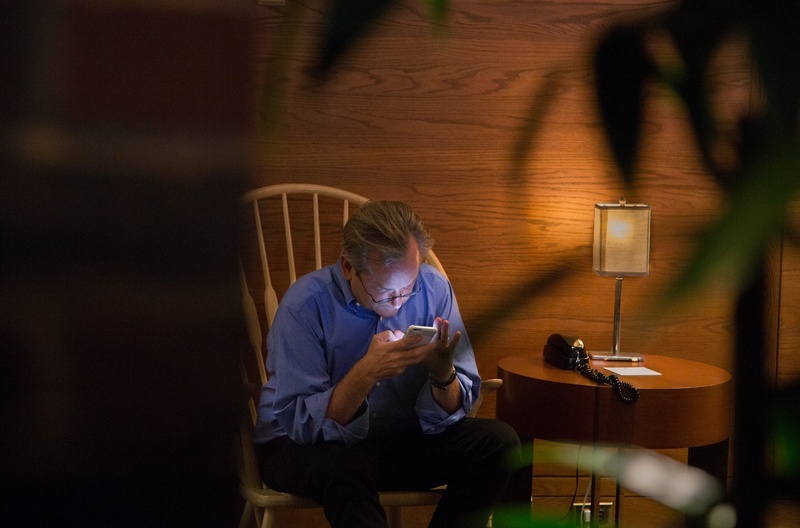 Harvard Law School professor Larry Lessig works on his cell phone in the lobby of the Charles Hotel. Lessig, who announced his presidential bid in early September, had been traveling extensively and was anxious about booking a last-minute flight to Washington, D.C.
Lessig’s personality, many initially thought, was not suited for so much public attention. He is not by any means an extrovert. But he does have an uncanny ability to captivate an audience time and time again, in his classes at the Law School or in TED Talks broadcast around the country. If his personal style seems, at times, unpresidential, Lessig makes up for it with a deep interest in, and understanding of, creative ways of relaying information. Close colleagues of Lessig’s cite his spellbinding Keynote presentations as a prime example of this. After spending up to 24 hours designing and perfecting a new presentation, Lessig takes to the stage and keeps an audience enchanted, performing what Nesson calls a “dance,” and Sullivan, the former Stanford dean, considers an “opera,” of sorts. Perhaps it’s because his presentation style was so new and captivating in the early 2000s that Lessig grabbed national attention, receiving a steady stream of interview requests and questions every day. One technique, Lemley says, was to have two computers in his office at Stanford, one at his desk and the other near the window. The computer at his desk was not connected to the internet. And once, after returning from vacation in Madagascar, Lessig declared “email bankruptcy,” telling people that he was deleting everything from his inbox and advising them to send him a follow up email if they really did need something from him. But despite how overwhelming the internet can be, Lessig embraces its power. Google “Larry Lessig” today and you’ll find links to his Reddit thread and his Tumblr, where he still remains quite active and candid in his postings, encouraging followers to engage him in conversation or bring up an argument that he can then refute. At some point in the last few years, someone designed for Lessig the now-iconic and viral cartoon version of his face—ruffled grey hair framing a yellow, oval face, small beady glasses hiding his eyes, and a slight smile, or smirk, playing out below. And with 355,000 Twitter followers, his online presence is wide. Lessig proudly reminds anyone that he’s been on the internet since “it left the geek world and entered the real one.” Plus, he points out, he taught some of the first classes on cyberlaw. The ease with which Lessig engages online communities may perhaps make up for a lack of personal style, but it’s ultimately unsurprising. His online ubiquity hardly seems intrusive, as the social media efforts of other public intellectuals may sometimes appear, because, in many ways, the history of the internet can’t be explained without Larry Lessig. Lessig has rigorously pursued his projects before, but obviously nothing so large-scale as a presidential run. The intricacies of political campaigning are new to him, and while the first stages of his candidacy may seem hectic, they’re mirrored on a smaller scale: his family life maintains a state of healthy disorder. 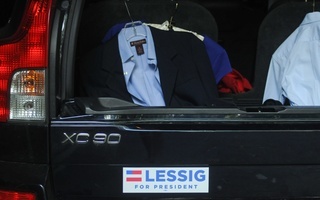 On Sept. 9, the day he declared his candidacy, I rode up with Lessig’s family to Claremont. That morning, at their house in a quiet neighborhood in Brookline, the family rushed around, anxious to leave but already running late. Neuefeind’s mother and father, who live in St. Louis, helped herd the three kids into the car, also cleaning up a pile of colorful plates left on the kitchen table and packing up coolers of healthy snacks for the ride. Ingrid, Neuefeind’s mother, even had time to squeeze in a quick violin lesson with Willem before sending him off, the sound of a beginner’s scratchy, crooked bow ringing throughout the house and audible from the front stoop. The kids were missing school that day to attend their father’s launch event. Though Neuefeind called the school that morning to explain why, their absences were not excused. She said she would deal with that later, joking that she should have called them in sick instead. The drive from their home took a little over two hours, more than enough time for the kids to get rowdy, and hungry. Willem, the oldest, wanted to buy some snacks with a dollar he had in his pocket. His mom suggested he give the dollar to his dad—“You haven’t donated to his campaign yet”—but he ended up buying a glow stick for 99 cents at a rest stop along the way. Teo, the middle child, is eight and restless, squirming a little more each time his mom told him no, we’re not almost there yet. “All of my friends are saying, uh, congrats, your dad is running for president,” Teo half-giggled as he tapped his fingers, playing a game on the family’s iPad to pass the time. Tess, Lessig’s only daughter, yelled up to the front of her car that she’d already invited her friends to the White House. 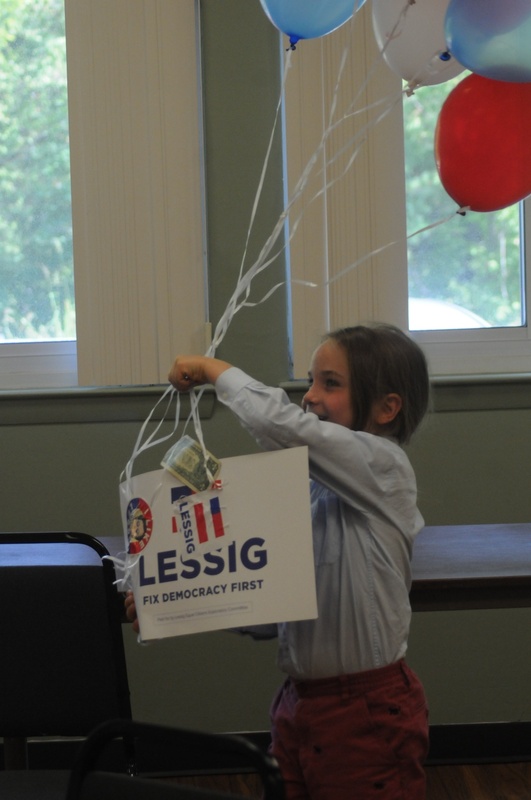 She had turned six the week before, and once the family arrived at Lessig’s launch event, wiggled into a flowing white dress her parents bought her for her birthday and ran around all day, the loose ends of the bow flowing behind her like a tail. Their family is accustomed to the frenetic tone of life that comes with Lessig’s work, but are still uncertain about what a presidential campaign will entail. It’d been only a few days since Lessig announced he would run, Neuefeind said. She didn’t know what to expect. Neuefeind is herself a successful lawyer. She was educated at the University of Chicago and is currently a research fellow at Harvard, working on food law and food literacy education. Over the next few months, she’ll be juggling a large project at the Law School with the increased parenting demands her husband’s presidential campaign leaves her. This general disorganization, manifest in the nascent stages of his campaign, and in his home life, would seem to spell a premature doom for Lessig’s presidential aspirations. But as his friends attest, his campaign is fundamentally different, and so it’s silly to gauge its strength by traditional standards. Other Law School professors have held political office—among them Elizabeth Warren and Elena Kagan—but unlike them, Lessig does not have any long term political plans. He’s not in it for the position, friends say; he’s in it for the cause. “People do characterize it as a vanity project, which could not be less true,” Neuefeind says. Lessig’s latest academic obsession, institutional corruption, is framed by his activism. Like his work in cyberlaw, he’s taken his research outside the classroom, but this time, he’s reaching out to an even broader American public—the voters. Though he may seem like a verified political upstart, Lessig has been interested in the workings of the American electoral system for years. At Harvard, he headed the Edmond J. Safra Center for Ethics for about five years, called for a second constitutional convention whose purpose was to excise money from politics, and created a super Political Action Committee, Mayday, designed, ironically, to put an end to super PACs and elect congressional candidates to pass campaign finance reform. In January 2014, he made the first of many miles-long walks across freezing New Hampshire to “declare independence from big money in politics.” His oldest son, Willem, even joined him for an 11-mile walk this summer. Because Harvard is a charitable, educational institution, it cannot support Lessig in any way politically. That means Lessig’s Harvard assistant, Susan Cox, isn’t allowed to help schedule his campaign events, so he needed to find someone else. Under University rules, Lessig can take a teaching leave of up to two years, but no longer. And under most circumstances, Lessig is protected under Harvard’s tenure system, meaning that no matter how large and even outlandish his campaign could become, he’ll have job security here. Lessig’s critics, however, charge that the campaign is foolish, or that it has the potential to draw attention from other Democratic contenders like Hillary Clinton or Bernie Sanders. Even some of his friends don’t think he’s serious about the run; rather, he’s using it simply to draw attention to the problem of big money in U.S. elections. Lessig begs to differ. “I wouldn’t do this if I did not seriously intend to become president,” he says firmly. Of course, he acknowledges, it’s not up to him to decide whether or not he’ll win the 2016 election, let alone gain the Democratic nomination— which if you look at current polls seems unlikely. First, he’ll need to find a more mainstream spotlight, which he’s hoping to capture at the first Democratic debate in Nevada (if he clinches a spot). That’s his campaign’s top priority right now. Teo, Larry Lessig's son, cheers on his father's presidential campaign after Lessig declared his candidacy in early September. In keeping with Lessig’s embrace of technology, the campaign relies heavily on volunteers from around the country who organize on Google groups and forums, says Jeff McLean, an organizer in New Hampshire. Lessig’s campaign also employs a “lightweight” staff, though McLean wouldn’t specify how many people. Thomas Lyman, Lessig’s nephew, says he sent an email to campaign staff asking how he could help, and he never got a response. He laughs about that, given that he should just ask Lessig anyway. Eager to help, Lyman is now the mastermind behind the @Georgia4Lessig Twitter account (which has 47 followers), and his wife helps design campaign graphics. It’s a small group, grassroots in the political realm even though they have been able to raise more than $1 million. They rely on a network of friends Lessig’s made throughout the years, especially friends he’s made in the past decade who support his vision of restructuring elections in order to reform democracy. Ultimately, of course, there’s no preformed political machine to grant order to the nascent Lessig campaign. In the absence of such a structure, Lessig is relying on his tested strengths to unify the campaign: an abounding knowledge of the internet and its outreach capabilities, a deep understanding of the American electoral system, and—perhaps most importantly—a penchant for obsession that drives him to singlemindedly pursue a goal to its end. In some ways, Lessig’s story is easy to write. It makes sense. It’s logical. He’s thought about it a lot, the smooth trajectory of his work from constitutionalism to activism, the connections he’s found that link all the pieces together. He deeply immerses himself in a subject, he lives it, and then, after a while, he stops. At the restaurant the day after his campaign, Lessig speaks quietly, turning his head occasionally to observe the growing crowd. Certainly, Lessig’s created a lot. Creative Commons, Stanford’s Center for Internet and Society, the Mayday PAC, just to name a few. Neither of which he’s directly involved in anymore. He did indeed let them go, moving on to his next venture. But underneath that calculated certainty and careful analysis of his own life, Lessig is worried. He worries about his family, his kids. His mother-in-law says whenever Lessig returns home after a trip the kids wait for him, racing to the door to meet him, yelling “Papa!” How often will they be running to the door over the next few months? 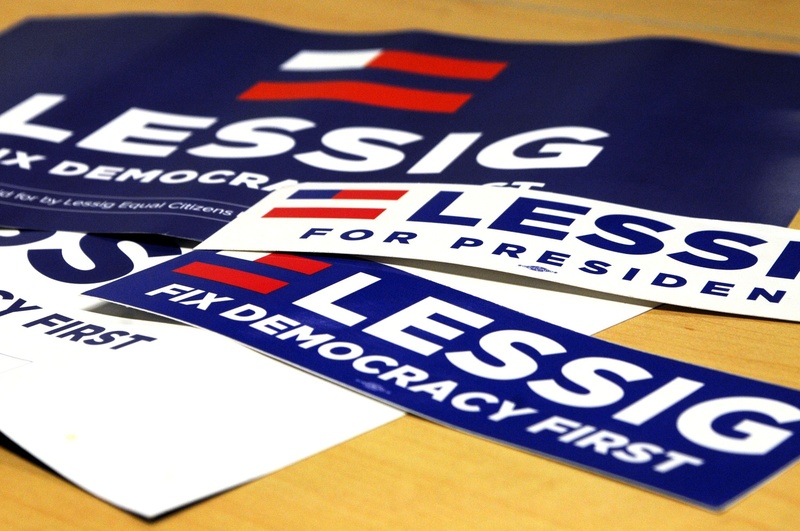 Staged memorabilia, both posters and bumper stickers, boast Larry Lessig's campaign motto: "Fix democracy first." Lessig officially declared his candidacy on Sept. 9. He talks a little while longer, glancing from the clock on his phone to the busy restaurant, fidgeting. Undoubtedly the flight to D.C. is on his mind. He’s mentioned it a few times, and it seems like he wants to leave. Luckily, he’ll have an assistant again in the next few days, one who isn’t affiliated with Harvard, who can help him pack as much as he can into his schedule. Lessig gets up from the table to pay for his coffee. The professor doesn’t have any classes scheduled this semester, and depending on how his run goes, he may not have any next semester either. He knows he’ll miss it, but he doesn’t anticipate staying away from teaching and writing too long. After all, that’s where he started this work. He wants to end there, too. Lessig's activist campaign might seem fanciful, but it has nevertheless accurately demonstrated the absurdity of our political system.